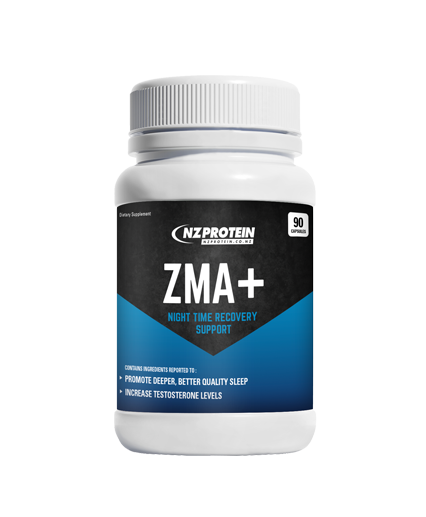 NZProtein ZMA+ is a mineral supplement containing zinc, magnesium, and vitamin B6. This combination has been reported to increase anabolic hormone levels and muscle strength in athletes, and improve recovery (from improved quality of sleep). ZMA is one of the most popular hormonal and sleep supplements available and stacks well with creatine, glutamine, and other strength & recovery products. Piper Nigrum (Black Pepper Extract) has been added to improve absorption of these in the body. Take 2-3 capsules daily, ideally on an empty stomach 30-60 minutes before bed, or as otherwise directed. For best results men should take 3 capsules daily. The recommended dosage for women is 2 capsules per day. Great product like all of the NZ Protein supplements that I've used. I get a good natural nights sleep and they're very similar to (old) line of ZMA that Cellucor used to make. Ingredients: Other ingredients: gelatin, encapsulating aid.